Our last interview from the anniversary issue of The Red Penny Papers comes from steampunk storyteller and songwriter, Mark Rossmore. 1. How would you describe “Iron Jack” in one sentence, for those who’ve not seen it yet? A dark, sexually-charged steampunk tale inspired by the Victorian era’s oh-so-delightful marital standards. 2. You write steampunk music as Escape the Clouds, and there seems to be a story behind each of your works there, too. Can you tell us a little bit about that? Music’s been used as a storytelling method since ancient times, and it’s fun to continue that tradition. The actual sound of the steampunk music genre is individual to each artist. For me, it’s about combining of themes, history, and instruments from both Victorian and modern times into something unique. I think of the songs as audio histories of events set in a past twisted and manipulated by “What if?” scenarios. For vocal songs, I tend to use a flash fiction approach. The lyrics are based on fictional characters I’ve created, or historical figures such as Jack the Ripper and Tiananmen Square’s Tank Man. At times it’s a challenge, since a song is usually only so long. Specific song “story” examples include “One Bullet”, “Louisiana Sunrise” and “The Surgeon’s Widow” from my latest CD Until the End, and “Captain Morena” and “In Your Sleep” from Circumnavigator. About half of what I’ve written are instrumentals. In writing fiction we take our time painting a sensory picture of what our characters are seeing, hearing, tasting, etc. and what we want the reader to experience. In a way, we’re shooting a movie through words, complete with scenes, characters, sets, and lighting. One of the most powerful elements of a film is its music. It can heighten the tension, set the mood, and spark hope where there is none. Knowing how well it can drive a story, I’ve written several soundtrack pieces that were companions to my fiction, including “Hunting the Future”, “Above the Overcast” and “The Undead Approach” off Circumnavigator. 3. Love it. So what’s happening next in your world, both in terms of fiction and music, and where can we get our hands on it? Music’s been my focus for the past year or so, but now that my third CD Until the End is out, I’m changing gears and diving headfirst back into writing. I’ve recently completed a zombie novella, which I’m thinking of using to test out the self-publishing waters. I have also just accepted a slot in a new steampunk anthology due out in early 2012. Then there’s those novel ideas I need to wrestle to the ground and finish. The boilers are all fired up, so to speak. Now to kick this train into motion! Thanks, Mark, that was good fun! If you all haven’t read his dark steampunk offering from this fall yet, now’s a great time to introduce yourself to “Iron Jack”. 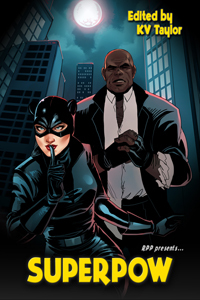 Buy the shiny new superpowered anthology from The Red Penny Papers, SUPERPOW. Currently available from select eBook retailers, and coming soon in glorious print!